Another farm field trip this weekend introduced me to the beauty of fresh fava beans. I have sampled these buttery beauties a few times before, but only from a can or cooked from dried. Favas, sometimes referred to as broad beans, are now at their peak, and experiencing them fresh from the field is highly recommended. 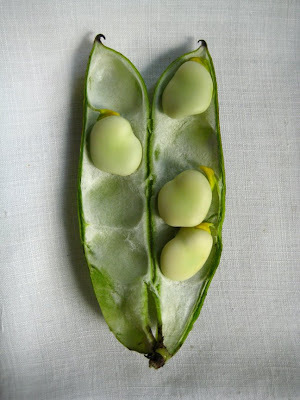 Fava beans are in fact, members of the pea family. They are incredibly nutritious legumes, especially high in fiber, protein, iron, and folic acid. They are low in fat and sodium. Additionally, fava beans contain levodopa (L-dopa), a chemical the body uses to produce dopamine (the neurotransmitter associated with the brain’s reward and motivation system). They can be eaten hot or cold, but they do not mash well, so making dips from them is not in your best interest. They work best as a filling for pitas and wraps, or in salads and stews. 1. Remove beans from their pod. 2. Boil beans for 3-5 minutes until tender. 3. Remove beans from boiling water and immediately submerge them into an ice water bath to halt cooking. 4. Peel away the outer skin from beans. 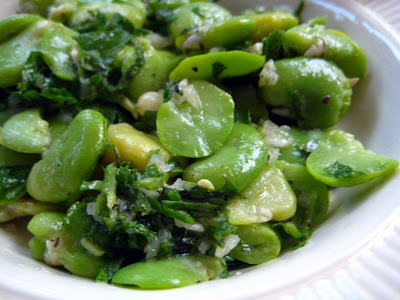 Here is a recipe for the fava bean salad I made for dinner tonight. It is very easy to prepare and the simple ingredients highlight, instead of overwhelm, the delicate flavour of the fava beans. This salad would also be nice mixed with quinoa, brown rice, and some crispy vegetables. A great side dish for any summer meal! 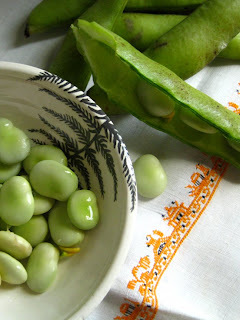 If you cannot find fresh fava beans, use canned or dried. Simplicity is divine, I loved every bite of it! Thanks Sarah for sharing your inspiring veg. recipes. Tried this on the weekend and it was dee-lish! mmmmm tasted just as good as it looks in that scrumptious photo. (makes me salivate). I bought fresh fava beans today. The process of peeling open each pod, boiling the beans, then peeling again, is so rewarding. Besides parsley I also used homegrown fresh mint. lovely. Yeah Sarah, thanks for introducing me the delicious fava, mm mm gooood.